The ‘Sunday Gravy’ for those unfamiliar with the term, is a tomato sauce in which meats, such as sausage, meatballs, braciole, and the like, are cooked so that they contribute their richness and flavor. The sauce, or gravy, if you will, is then served over pasta with the meat then being served separately, either at the same table, or perhaps as part of subsequent meals. 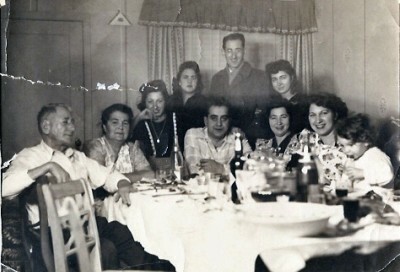 Personally, I love the whole idea of this lovely culinary tradition and, ever since being first acquainted with the notion, I have been fascinated by those recipes and recollections (like this)of those who describe their mothers or grandmothers beginning the base tomato sauce early on a Sunday morning and then adding the meats in various stages before the family finally assembles for the feast. Another loosely related culinary tradition that has long interested me involves those preparations like the Chinese ‘Master sauce’ in which a flavored stock is kept alive for years… generations even… by periodically replenishing and adding to the basic ingredients so that, over time, the various additions build layer upon layer of rich and complex flavor. I always laugh when I hear people calling it “gravy”–some Italians call it gravy, some call it sauce. My Sicilian family always called it sauce, but we had friends who had a Naples background and they called it gravy. I don’t have a real “recipe” because it’s just a little of this, a little of that, the same thing as my grandmother used, and how she taught my mother, who taught me. Looking forward to following along with you and your gravy! I read quite a few blogs in which the Italian author said that the word ‘gravy’ was never used but I think they must be wrong… I mean, I saw it on ‘The Soprano’s’ and surely TV would never mislead its watchers? I grew up in North Jersey in the 1950s and 60s and, trust me, it was called gravy. Very interesting and educational to me. I don’t know about Sunday gravy and even the master sauce! Look forward to reading more! Now that’s neat.. a gravy that’s healthier for us than what we typically call a gravy! So you’re thinking of keeping a little back each day and then adding to it? Very cool experiment! Well.. it will be cool to follow along! Having been introduced to “gravy” by one Mr. Nicki Sanducci of South Philly fame, I know exactly what you mean. He would nail anyone’s knees to the floor who said “gravy” was never used. I’m not joking. Having had gravy at his house (close to the used-to-be-there Italian Market Rocky ran through, and at several other houses in the area, I can attest that gravy it is. His mama still wore black with a black shawl on her head when she went out of the house and would smack the boys if she felt they deserved it. I’m not sure if they built on the recipe, but gravy was always going on the back of her stove and other stoves I knew of. and it was to die for…. (sometimes 🙂 I’m looking forward to the Gravy Tale, parts I, II, III, ad infinitum. I’m looking forward to seeing what happens myself… I’m afraid my experience is not as ‘authentic’ as yours. Pretty much my own kitchen and the odd Italian restaurant. I always thought calling it gravy was odd, my southern Italian family always called it sauce. I think calling it gravy is regional. I know in New Jersey it’s gravy. I think your experiment will be lots of fun. Looking forward to follow along! I love this post! It also made me think of Dyer’s in Memphis. They have been using “vintage” 100-year old grease to fry their burgers. When they moved their grease to their current location on Beale, they actually got Memphis PD escorts! That’s amazing … they must have been using animal fat. No vegetable product would stand up to that. 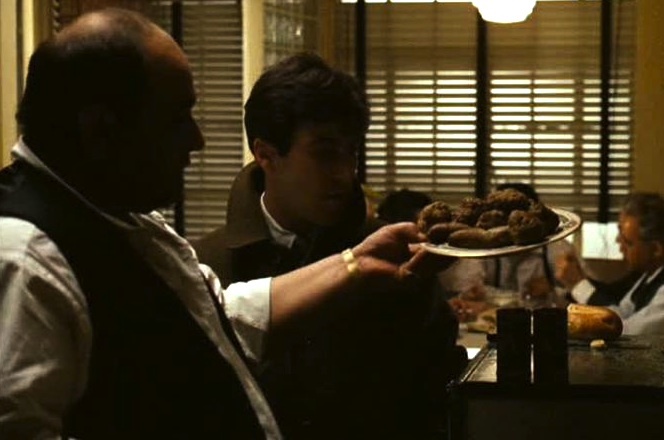 I always loved that bit of dialogue… the most memorable line in the movie though (also Clemenza) is: ‘Leave the gun …. take the Canoli’. Hahaha! I’d better be careful where I use that term, then! 🙂 I love the “canoli” line, too. Those books and movies were brilliant! Great, good luck with your starter stock. I saw a play some years back about an Italian family that had a working kitchen on stage and cooking Sunday sauce was an ongoing element. I think the play was called Saturday Sunday Monday? A very good play. I was very fond of a friend’s late mother-in-law, from Northern Italy, who always used the word ‘sugo’ for her sauce and she used cubed stew beef, not ground beef and cooked it until it just sighed and gave up. It was delightful & delicious. The word ‘gravy’ is used in movies, but it’s also used by NY/NJ Italians and non-Italians alike. Being from Texas, I’ve always associated ‘gravy’ with chicken fried steak. — Excellent post!